While testing my shooting in the dark skills, or more accurately lack thereof, at the recent Crimson Trace Midnight 3 Gun Invitational, I became sold on the concept of using a light on my carry gun. While I’ve used lasers on carry guns for years, I found the combination of light, laser and pistol fast and intuitive. Here’s a Springfield Armory TRP Government size 1911 with a Crimson Trace Lightguard and Crimson Trace Lasergrips. A great carry combination if you can find the right holster. While there are lots of tactical gun-mounted lights on the market, the introduction of the Crimson Trace Lightguard was a game changer for concealed carry. The Crimson Trace Lightguard is slimmer than the frame of the gun, does not protrude in front of the muzzle, features instinctive activation, yet still manages to throw 100 lumens of light towards your target. In short, it adds hardly any weight or bulk to a carry gun. But there’s always a “but” right? In this case, the “but” is that you need to find a holster that is molded to accept the Lightguard. 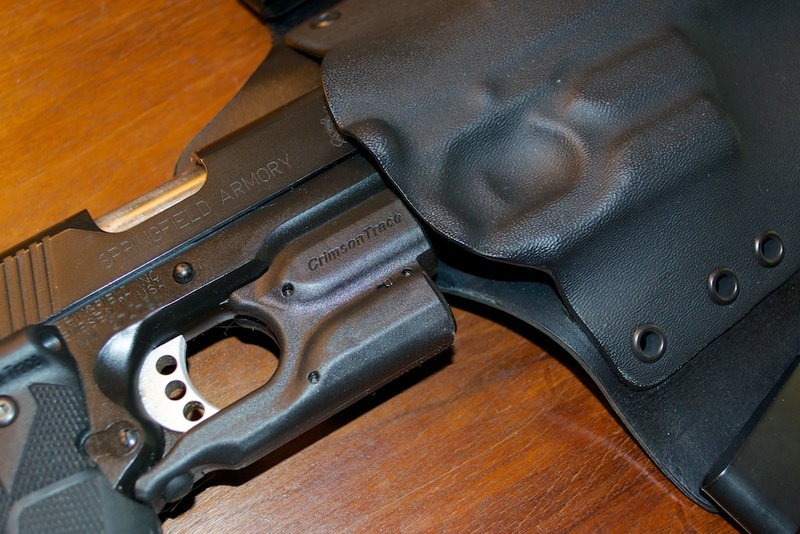 Yes, you can use a general purpose “pouch” holster, but if you want good retention and security resulting from a perfectly form-fitted holster, you need to find one that is made specifically for your pistol with a Crimson Trace Lightguard mounted. Why look at that! It’s a custom holster that’s Lightguard ready! Sounds simple enough, but here’s where exponential math gets in the way. If you multiple the number of lights on the market times the number of gun models on the market, you get a number even larger than Michael Moore’s waist size. It’s somewhere around half the diameter of the moon as measured in inches. This presents a near impossible situation for holster makers as they would have to produce 43 gajillion models to meet all the desired combinations. 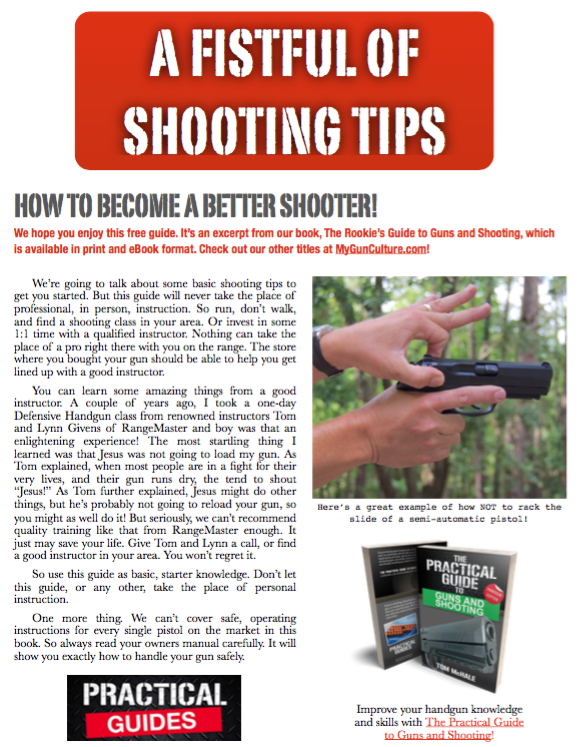 Here’s where White Dog Holsters steps in. You can tell Devin is a military guy as the attention to detail is great. Note the raised opening for the Lasergrip! Devin is one of those guys who saw opportunity and did the American thing – started a business to address said opportunity. While he makes standard holsters out of kydex and/or leather, he seems to be developing a niche of holsters designed for Crimson Trace Lightguards, Laserguards and Rail Masters. 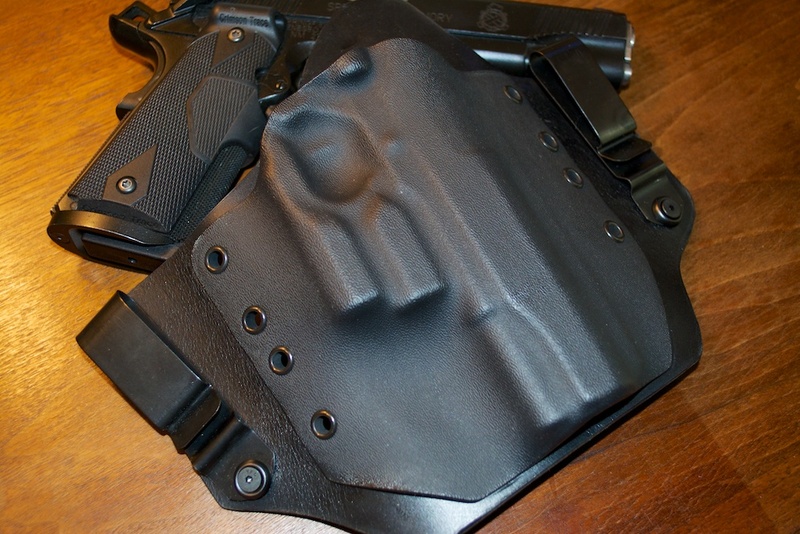 I just ordered the holster shown here. It’s the White Dog Mutt design which is a tuckable inside-the-waistband holster with a kydex gun pocket and leather backing. it’s similar to the Galco King Tuk. The difference is that this one is molded to be Lightguard and Lasergrip friendly. I just started using this, but can already tell it’s a winner. 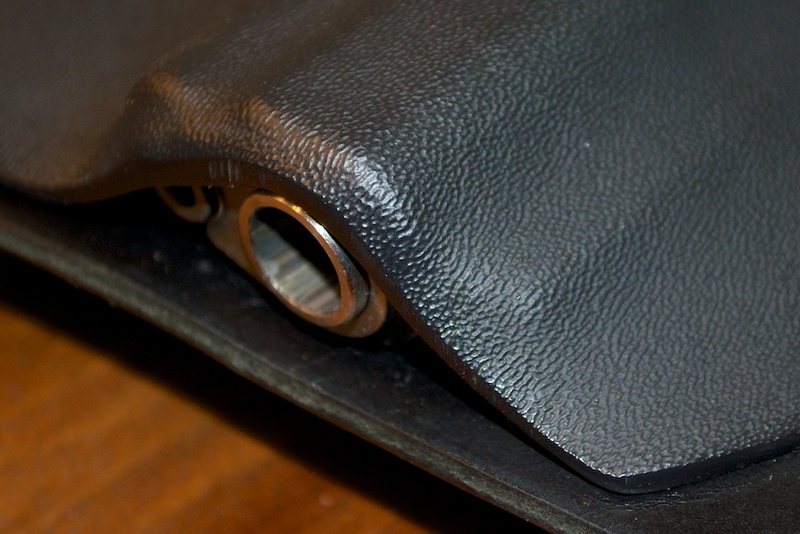 The leather backing is solid and well-finished. The kydex is perfectly molded with all the right detail touches. The clips are adjustable for desired cant angle and comfort. The bottom is open to let debris fall out, but note how the kydex is curved over the muzzle to aid retention and support. But again, there’s always a “but” to the story. Devin is also a guy who serves our country and has just been called to a deployment for a couple of months. This means you’ll have to wait a bit to order a holster from him. Keep checking the web site, he’ll be back making holsters before you know it. Thanks Dawyne – I posted this now as I just learned about it and don’t believe in filtering news – we get enough of that from the mainstream media. So far, this is the only IWB option I’ve found for a 1911 (and others) equipped with a Lightguard. So I’ll post and share what I find, then leave it to our readers to decide whether they want to wait or move in a different direction. Putting myself in a reader role, I would prefer to know that it exists now, then decide on my own whether I want to wait 4 months for it. But that’s my opinion. We here at Multi Holsters has been specializing in holsters with lights and lasers for a few years now. We have over a dozen different styles of holsters styles with dozens of different colors. Please check us out at http://www.multiholsters.com.